The digital economy has changed the demands of the modern CIO. IT leaders must consider the business impact, in addition to implementing, monitoring and maintaining IT infrastructure. In other words, they must employ a Business-first approach to everything they do, including their reliance on legacy systems. Discover how mastering data holds the key to modernizing the business. 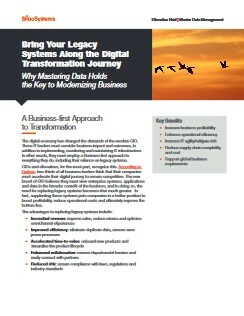 Download the executive brief learn more about transforming your legacy systems.